If you are using Safari, Opera or any other web browser which doesn’t support official StumbeUpon toolbar, don’t worry yet. There are few tools with less, same and even more functionalities that are officially supported in the toolbar. It will open a new page, just as if you “stumbled'”. In order to save it to your favorites, you will have to login to StumbeUpon first. 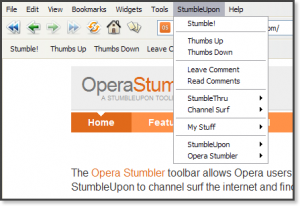 You can also install Opera Stumbler toolbar which will add a submenu to your menu bar. Just enter your username, password and you are ready to go. 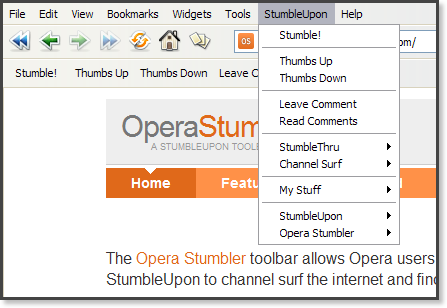 Few nice features in this toolbar are: StumbleThru which opens web addresses within a domain name and Channel Surf which opens web pages with a specific tag or keyword. 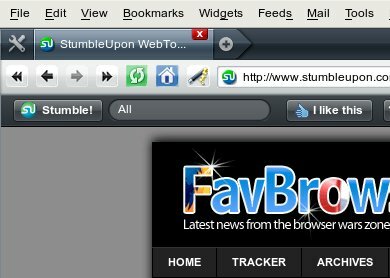 Stumbli, plugin for Safari which allows you to stumble 100 times (after that, you will have to pay $4). It supports stumbling and voting, toolbar buttons, submitting discoveries and send-to-a-friend options.